Meet-Me conferences are hosted conference calls from a college phone with a predetermined number and start time. Conference participants dial into the conference call rather than being added by the host. The host must join the Meet-Me conference first before participants will be allowed to join. Meet-Me conferences must be scheduled through ITS in order to reserve a number for the call. To join a Meet-Me conference, follow the directions below. 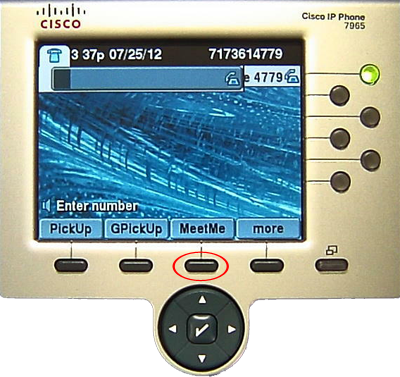 Note: Meet-Me calls must be set up by the host first. You cannot simply dial in to the extension to begin the call. Prior to the call, make sure on-campus callers have the conference extension number (71xx), off-campus callers the host phone number (717-361-xxxx) and all participants know the time to dial in. Step 1: Press the New Call softkey or pick up the handset. Step 2:Press the More softkey. Step 3:Press the MeetMe softkey. Step 4:Enter the Meet-Me conference number to begin hosting the conference (71xx extension). Note: Prior to the Meet-Me conference, tell the participants to call the hosting phone number (717-361-xxxx) on or after the session's starting time. Step 1: The phone hosting the Meet-Me Conference must be able to receive calls from off campus. On the phone hosting the Meet-Me Conference, press CFwdAll. Step 2: Enter the 4 digit Meet-Me number given to you by ITS. (71xx) Step 3: Press New Call. Step 4: Press More. Step 5: Press Meet-Me. Step 6: Enter the 4 digit Meet-Me number given to you by ITS. (71xx). The conference is now in session. Step 7: Conference participants can now call the phone number of the hosting phone (717-361-xxxx). This is NOT the 71xx number. 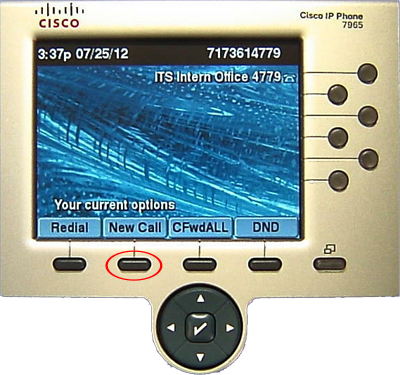 Step 8: End the Meet-Me conference by pressing EndCall. 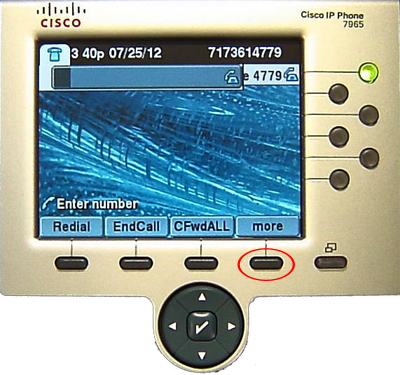 Step 9: End call forwarding by pressing CFwdALL. Warning: ANY call that comes into the designated forwarding phone during the conference time will automatically be dropped into the conference. If you are using your office phone or personal phone to forward calls, be aware that any personal callers will find themselves in the middle of the Meet-Me conference call. You can't control who will call in. If someone knows the extension, they will be able to join the call. You will hear an alert when someone joins or leaves the call. You can't mute other callers. They will have to mute themselves.